I am busy this morning and thought I would replay a post from several years ago. No reason except that I came across it yesterday and it really caught my eye again. 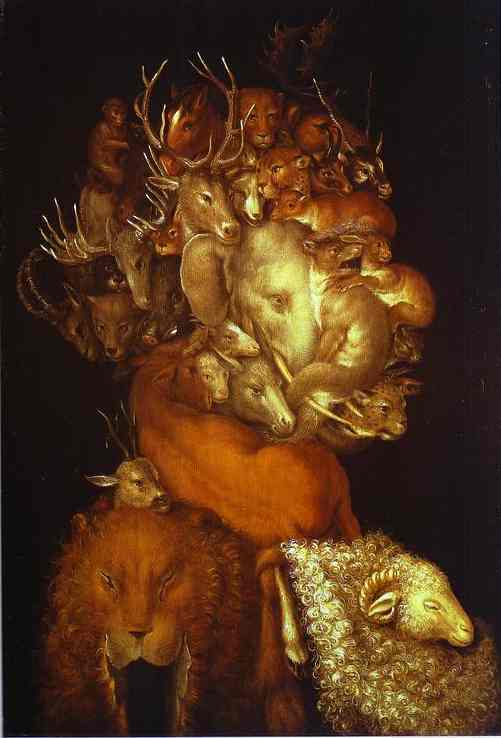 The work of Arcimboldo always does. But I did add a video that shows more of his work so it’s really a replay plus. Take a look– I think you’ll like it. 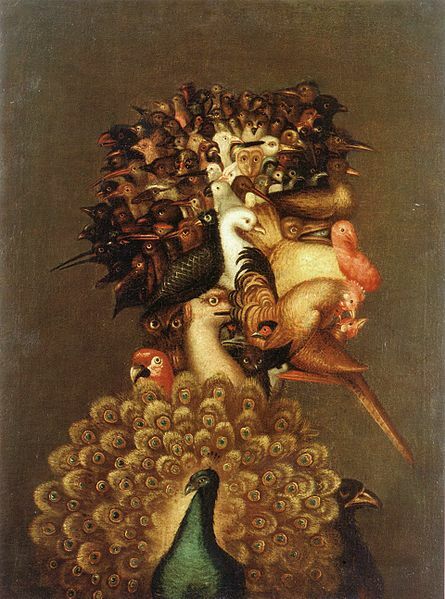 You don’t often think of work of art from an Italian Renaissance painter as being whimsical. Generally, they seem to focus on themes of religion and myth or on portraiture of wealthy patrons of the time, most beautifully painted. 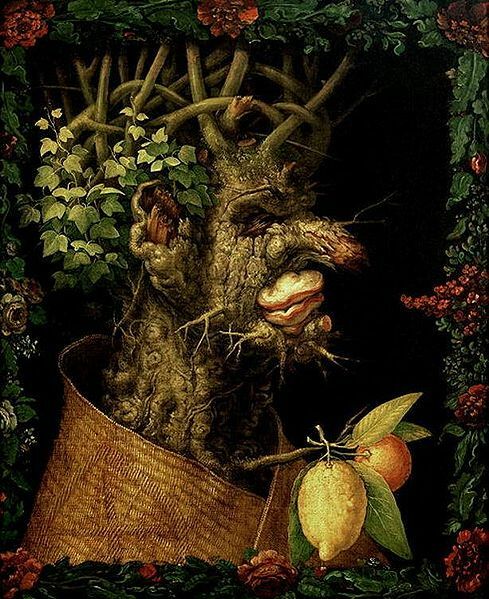 Then there is the work of Guiseppe Arcimboldo, who was born in Milan in 1527 and died there in 1593, although much of life was spent in the service of the Hapsburg courts of Vienna and Prague. 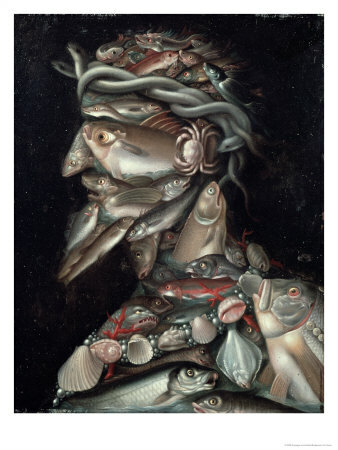 Arcimboldo was trained as stained glass designer and painter and initially worked in these fields in a traditional manner. Much of the work from this time has faded into oblivion, although there are examples of his windows and a fresco or two. However, it was his other work that gained him fame in his time and which has came through the ages as a constant source of fascination. 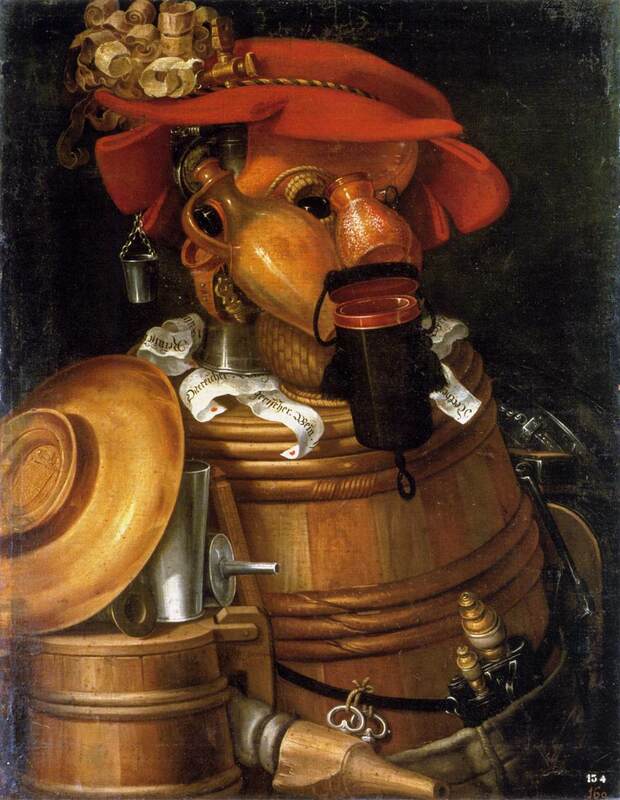 The other work was creating portraits, sometimes of his patrons such as the portrait at the top of Rudolf II, Holy Roman Emperor from 1576 until 1612 , that are composed using all sorts of objects to create the figure and features of the subject. He used fruits, vegetables, birds, books, fish and many other objects in creating these unusual figures. The final result was always striking, colorful and whimsically imaginative. 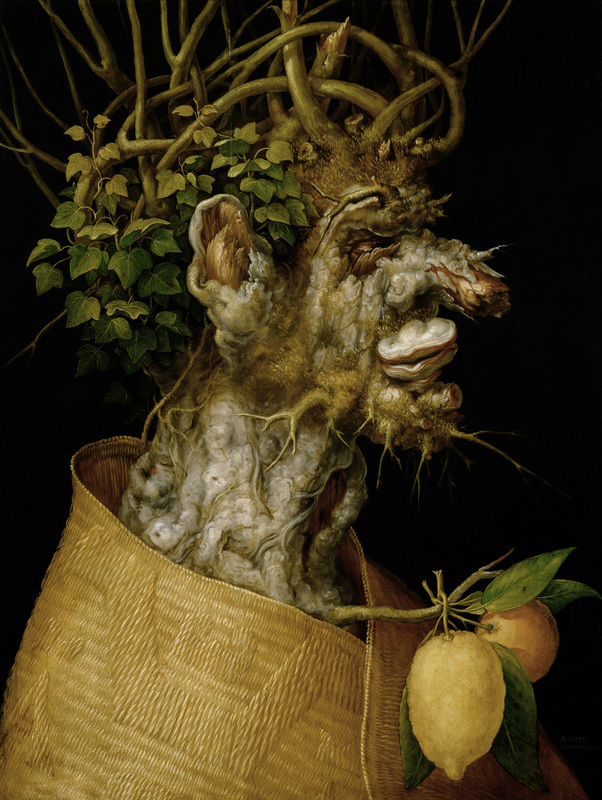 And sometimes grotesque, even a bit spooky– I’m thinking here of a series of pieces that Arcimboldo created portraying the Winter season as a person, such as this example on the right, painted in 1573. 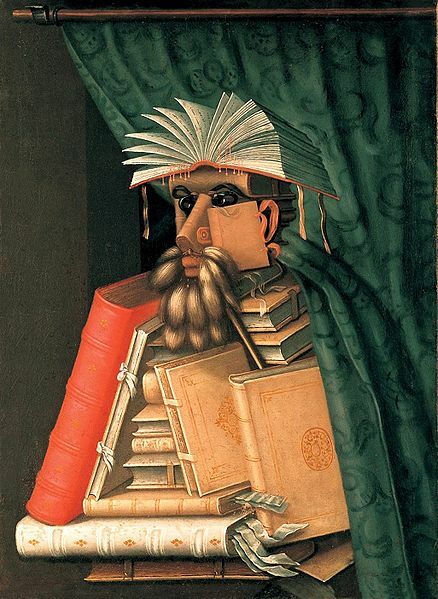 Arcimboldo’s work always brings a smile to my face while also stirring my interest in how he must have worked at the time and how he was perceived in that era. I am sure he was both admired and disliked for his unique work. Whatever the case, the work remains a fascination. 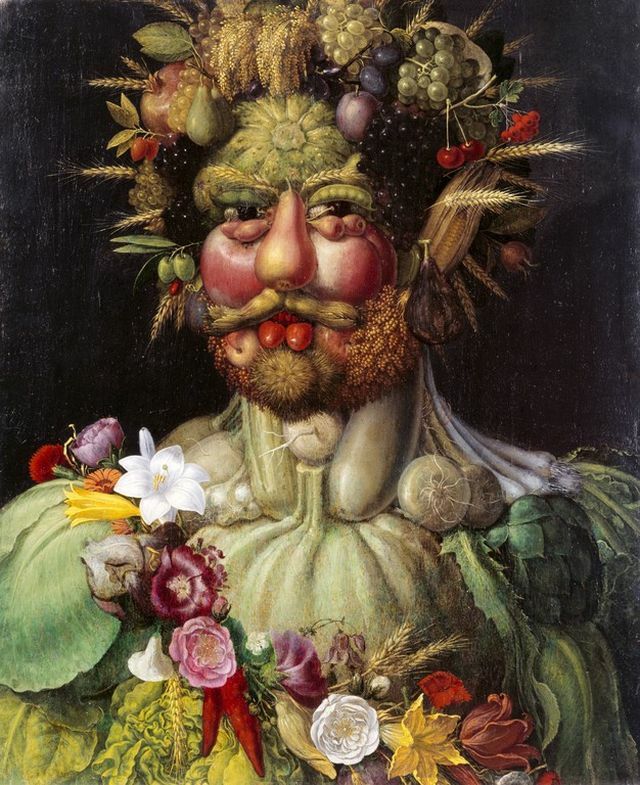 I am showing several example here but you can go a site– Guiseppe Arcimboldo: The Complete Works— that features a broader view of his work. Very interesting. There are so many details to take in in these paintings that it is easy to overlook any little detail. I saw that as money as well. Your mother’s books were an interesting place to keep her cash!